The British are bowing out. Now the EU is a battle between the French and German visions. The European Union dominates British politics at the moment – but in a rather superficial way. It is focused on the short-term implications of the country’s relationship with it, and not on the institution itself. And that is true especially of continuing Remainers. They concentrate so much on stopping or diluting Brexit that they avoid tackling questions about what the Union is, and what it is turning into. More thoughtful Leavers will no doubt suggest that the focus on Brexit is a displacement activity from more uncomfortable questions about the EU. So it is worth taking a step back from the kerfuffle about Brexit to think about the Union itself. I think it is helpful to view the debate over the EU as a conflict of three visions. I will characterise (or caricature) these as the British, the German and the French visions. The British vision is of the union as a free trade area; its fundamental purpose is economic, and to bring to its members the manifold benefits of free trade. The British are divided on whether this necessarily includes the free movement people, or, rather, labour (as opposed to temporary visitors, which most people are happy with). Many older people (and probably a majority) think emphatically that it doesn’t, and that goods are fundamentally separate from labour. Younger voters tend to say that it does – seeing free movement as a way to expand their personal horizons. Some are muddled – wanting all the benefits of retiring to Spain and using its health service for free, while stopping people from moving into Britain. But all sides treat this as a fundamentally economic question. and think of it individualistically – how does it benefit me? The Germans feel that the fundamental point of the EU is to create transnational order. This affects trade, so that manufactures and services are based on common rules, and that countries don’t get an unfair trading advantage through lax labour or environmental laws. But it goes deeper; they see nothing wrong with rules that secure fundamental political principles, such as human rights and the democratic order. Britons tend to resent this as an unnecessary intrusion, feeling secure in their own country’s institutions – different histories do much to explain the different attitudes. Britons have learnt to trust domestic institutions; Germans (right up to 1990 in the East) have learnt that trust can be abused. The Germans’ outlook is more collective than the Britons’ – but they share Britons’ distaste for political meddling from EU institutions. But the French, on the other hand, emphasise the political union. To them it is a joint political project, in which their country must take a leading role. They tend to see the EU as a counter to the giants that stalk the world stage, and in particular to the US – but also to Russia and China. Internally they advocate a greater use of political mechanisms to resolve the problems and conflicts within the Union itself. This is the most collectivist view. If Europe as a whole advances, the logic goes, then we all do as individuals. The British tend to view it the other way round. It is tempting to suggest that these three visions are all right, and that some form of reconciliation or compromise must be found. But I find it more helpful to see the three visions as varying stages of understanding of what the European project implies. A free trade area cannot reach its potential without transnational rules, including some form of transnational arbitration. And you cannot have such a transnational system of rules in the long run without common political processes to manage them. The North American Free Trade Area (NAFTA) was often held up as an example of what “just” a free trade area might look like – but it first lost momentum and is now in imminent danger of collapse, as it has been unable to handle the political tensions it has created. The French understand the implications of the EU the best, the British the least – which, of course, is the main reason why Britain is leaving. Most of the British public do not want to accept the political implications of the EU; many of those that voted Remain were in denial, and voted that way to maintain their own short-term economic prospects. The whole Remain campaign last year was based on little more – one reason that the more thoughtful Leavers feel that it is they that hold the high ground. With Britain on the way out, the driving tension will now between the German and French visions. The British view was shared by other members, especially the Scandinavians (as a matter of principle) and the eastern members (as a matter of political convenience). Brexit not only removes the British view’s biggest advocate, but also it points to the ultimate destination of countries that follow it. The Franco-German tension could ultimately destroy the union. The Germans are easily the union’s most powerful member; but the French are ultimately right – the Germans are simply postponing an inevitable reckoning. This tension is most easily seen in the management of the Eurozone. The EU’s treatment of Greece, for example, was brutal and surely misguided – even if I find most of the pleadings by Greek politicians such as Yanis Varoufakis to be self-serving and evasive. To the Germans, the Greeks simply broke the rules. They lied about their economy to get it into the Euro, and then milked the Union for all they could get with no attempt to make their economy more productive or less corrupt. The crisis was a reckoning, and it must be played out according to the rules. That Greek voters approved of gobbling up their neighbours’ resources as an easier alternative to fixing deeper problems at home did not make what they were doing democratic. But this view is also self-serving and evasive. German banks contributed mightily to the Greek bubble, and German businesses where happy to sell things to people who could not afford them. There must be a principle of caveat emptor. Instead the German taxpayer bailed out their banks, and their government is trying to blame the Greeks. It is a political mess that requires a political solution, and that means some of the rules must be changed. It is clear, for example, that much of the Greek government debt must be forgiven. The country also needs financial aid to help its economy to grow on a financially sustainable path. But that implies accountability from the Greek government. And yet the French view, which is now being vigorously pursued by its new president, Emmanuel Macron, leaves hard questions at its core. It requires stronger and deeper transnational institutions, whether at the EU or Eurozone level. But are the democratic institutions up to the job? And is there democratic consent for them? And how deep must these central institutions go? The type of problem posed by Greece persists: member states trying to take the rest of the union for a ride – to take the money, but without any any serious attempt to develop an open and efficient economy, buttressed by democratic institutions, based on the rule of law applied without corruption. Challenges aren’t just being presented by such countries as Hungary and Poland, but by countries closer to the heart of the picture, like Italy. And France. And even Germany with its destabilising surplus savings. Mr Macron’s strategy is to boost France’s credibility by reforming its economic institutions. But what will make other countries follow this path? What will happen next will be the usual European muddle and fudge. That muddle and fudge will either lead to disintegration, or to something that looks much more like a federal state. Or both – if more countries leave but a more integrated core remains. And that poses a challenge to British Remainers, who either want to reverse Brexit, or to rejoin the union at some later stage. If Britons remain wedded to what I have called the British view, this will end badly. Britons must accept that they are signing up to a political project that reduces the sovereignty of the British state. Liberal Democrats, in particular, need to understand when there will be too much European centralisation, and when they would say no. After all their other rallying cry is the decentralisation of political power. And me? Fundamentally I am a Frenchman on this. Proud though I am of my British and English identity, I also have a strong sense of European history and identity. I long to be part of a joint European political project. But not even I have thought through the full implications – and I am in what looks like a small minority. For that minority to grow, more persuasive arguments must be made. Posted on July 25, 2017 Author MatthewCategories Politics UK, WorldTags EU, Euro6 Comments on The British are bowing out. Now the EU is a battle between the French and German visions. Are Eurosceptics suffering from the boiled frog syndrome? Within two years the United Kingdom will have a referendum to decide whether or not it stays in the European Union. Despite a fair amount of noise in the media, the serious political campaigning hasn’t started yet. But the Ins seem to have the edge. This is an interesting turn of events. It helps to put your passions to one side to make any sense of the emerging campaign. I heard one commentator suggest that the electorate is split into three roughly equal shares: those who are firmly for In, those firmly for Out, and those who are floating between the two. I don’t know how accurate the numbers are (the firm Ins sound a little high), but it’s a good way of looking at it. The campaign will be decided by the floating third, and these voters do not have the emotional investment in the issue that of either the Europhiles like me, or the Eurosceptics. The arguments the committed supporters on either side find convincing will cut little ice them. The In and Out campaigns will have to concentrate on the sort of arguments that will sway these uncommitted voters, and not those that have already made up their minds. I think that this is giving the Europhiles the edge. Until recently the Eurosceptics have had the field to themselves. They dominated the media with their passionate arguments about sovereignty, over-regulation, and the general incompetence with which the EU is run. Europhiles were in despair; we never heard somebody coming up with a really convincing argument about why we should stay in – just some rather soft stuff about trade and peace and international prestige. We were losing the argument, it seemed. The Outs raced ahead in the polls. But they also became over confident in the strength of their own arguments. The Europhiles, on the other hand, were forced back to a more realistic assessment what they had to do – and they realised that the main thing going for them was sheer bloody inertia. Passion would not win the day for them. But the Eurosceptics, or too many of them, still think that their passion and argument is what is needed. But this is no good for the cold, hard job ahead. That they can’t agree to form a single umbrella organisation shows that they haven’t understood this – discipline among the passionate is hard. 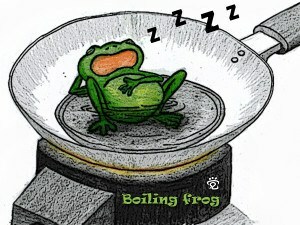 It reminds me a little about the fable of how to boil a live frog. The story is that if you throw a frog into hot water, it will just jump straight out of the pot. But if you put it into cold water and slowly heat it up it will not notice until too late. I hope nobody has tried this out on real frogs, and it almost certainly wouldn’t work if they did. But makes an important point anyway. The Eurosceptics have been placed in a favourable media environment, like the frog in cold water. But ever so gradually it has become less favourable. The turning point was probably when the Prime Minister, David Cameron, decided to call his bankbenchers’ bluff and hold a referendum. Then it was clear that leaving was no longer a theoretical proposition, and the quiet voice of inertia started to speak. It was certainly no great push by the In camp in the media. The polls slowly but surely turned against the Outs, though in the last month the Ins have dropped back, after Europe struggled with the refugee crisis. Too many Eurosceptics haven’t noticed how the climate has changed, and are failing to adapt. This is especially evident with attitudes to Mr Cameron’s “renegotiation” of the UK’s membership terms. This clearly an important part of the In strategy. He plans to flourish some impressive achievements to the electorate as a clinching argument to the floating voter group. This could be a decisive move, but only if he manages to exceed expectations. So a subtle Out campaign should be trying to raise those expectations. Instead most of them pouring scorn on the whole exercise. The Europhiles are egging them on by also playing down expectations – but that is in their interests. To be fair, some of the Outs understand the problem. Lord Bamford, a notorious Eurosceptic, has reserved judgement on Mr Cameron’s renegotiation, and is wisely holding his fire for now. This was flagged by some of the Eurosceptic newspapers yesterday. That is better than slagging off the whole exercise, but still not quite the position they should be taking. But things are far from hopeless for the Outs. Three things might work for them. The first is if they can focus anti-establishment anger on the EU. The establishment – mainstream politicians and big business leaders – will largely rally behind the Ins. And yet the public is suspicious of these figures. Anti-establishment-ism played well for the SNP in the Scottish referendum, though it still wasn’t enough. But that was a very different situation. The second thing that could play well for the Outs is panic about immigration. Free movement rights within the EU is one of its great glories, and has been of enormous benefit to Britain – and Britons make use of it themselves with glee. But immigration makes most Britons nervous. If this nervousness is raised to panic proportions, the Ins have no really convincing answer. Unfortunately it makes no difference whether or not the panic is actually relevant to Britain’s membership of the EU. The media storm over migrants at Calais earlier this year had nothing to do with British EU membership (the situation would be just the same, perhaps worse, if Britain was out) – but it still dented people’s confidence in EU membership. And the third thing is chaos within the EU itself. This might arise from the ongoing refugee crisis, or from another Euro zone crisis. It makes no difference that both these crises show that Britain’s already-negotiated opt-outs allow us to stand on one side. It still reduces the comparative advantage of staying in over leaving. For all that the Ins need to hold their nerve. The best case for In is an unspectacular one. Britain has prospered by and large in its years as part of the EU (even if you can’t prove it would have been worse off out); EU processes are deeply embedded into our way of life – as the passport controls when travelling to EU countries shows. Leaving the EU would create a colossal mess which would, incidentally, put the Union at risk. It is up to the Outs to make a convincing case that life would be actually better outside. Not that things wouldn’t change much. And in concrete terms that affect daily lives, not in terms of abstract ideas like parliamentary sovereignty. That will be more than hard for the Outs to do. So that is why I’m not that bothered that the launch of the In campaign this week was a bit anaemic, and is chairman a bit colourless. The task in hand is bit like that of a defence lawyer: not to prove his clients’ innocence, but to make the prosecution stew. in its own contradictions. Like that boiled frog. Posted on October 15, 2015 October 15, 2015 Author MatthewCategories Politics UKTags EU, EU referendum2 Comments on Are Eurosceptics suffering from the boiled frog syndrome? I am one of nature’s political optimists. But 2015 is one of those years where it is all going wrong. The Lib Dem near wipe out in this year’s UK General Election, for one thing. The rise of Islamic State is another – along with the spread of vicious Islamophobia promoted by such outfits as Britain First. Meanwhile state after state in the Middle East and Africa is failing, with vicious dictatorships taking hold in other countries. This gives Israeli hardliners the cover they need advance their own brand of apartheid, and the ghettoisation of Gaza. Any attempt at finding a humane middle way is undermined by extremists of one sort or another, in country after country. And now, as Gideon Rachman points out in yesterday’s FT, the European dream is dying before our eyes. The idea of ever closer European union was one of the formative ones in my own politics. In 1975 I was a 17-year old that was definitely ready to vote in that year’s British referendum on Europe. I’m not sure why it should have caught my imagination so – I grew up in postwar prosperity, where the World War was just an interesting piece of history. I suppose I found British society so staid and constricting that I wished for its institutions to be subsumed into something much more modern and exciting. I meet many people of my age that feel the same way though. But apart from opening out British society and commerce, the EU represented a path towards civilised governance and prosperity for the undemocratic countries on its fringes. Greece was the first country to take the path of throwing off dictatorship and coming in to the mothership of Europe. 35 years on and the achievements look hollow. Greece took on the trappings of a well-managed European democracy but did not take it to heart. It remained run by a rich elite which did as it pleased, while bribing the rest of society with generous pensions and meaningless public sector jobs. They became artful in keeping that show on the road by extracting grants and loans from the rest of the union at the same time as disregarding rules they did not like. They even managed to join the Euro, reducing borrowing costs, and allowing the fiction of a properly functioning European state to continue. But sooner or later the music had to stop. And when it did the foundations of the European project looked shallow. There is an absence of trust and solidarity. The Greeks themselves, or at least those that govern them, seem in denial about the sort of reforms that will be needed to get them on the path to prosperity. They claim to be victims, condemned as to doom-spiral of “austerity”, with many Anglo-Saxon economic commentators (Noble Laureates Paul Krugman and Joseph Stiglitz among them) cheering them on. But dig a bit deeper and we find that words such as “austerity” and “reform” have been abused so that a lot of the dialogue is at cross purposes. The Syriza government wants to reform some aspects of the Greek state, but sees no problem with those aspects that I have referred to as “bribery”: maintaining ineffective public sector jobs and unaffordable state benefits, such as pensions.This leads to the suspicion, especially amongst Germans, that all the Greek government want to do is to keep the old, failed way of running the state on the road, lurching from bailout to bailout, using moral blackmail each time. The Germans, of course, are hardly blameless. Their banks kept the Greek show on the road, in the apparent anticipation that their government would bail them out if things went wrong. That expectation proved sound enough – most of the bailout money went to them, and practically nothing towards providing the investment the Greeks so badly need. The Greek government’s moral case is not entirely hollow – but their combative approach to negotiation is destroying trust. No wonder that British Eurosceptics urge the UK government to emulate such tactics in their dealings with the EU! Even now the Greek Prime Minister, Alexis Tsipras, suggests that a No vote in the forthcoming referendum is just a step in the negotiation, not a real moment of decision. Those European leaders who have been trying to fudge things to get a deal, like Claude Juncker, the President of the EU Commission, feel betrayed. The prospect of Greece dropping out of the Euro and then the EU is steadily growing. This would be a calamity for Greeks, and raises the prospect of yet another failed state. As more than one commentator has suggested, if the Greek ruling elites had what ti takes to run an independent monetary policy, they would not have got into this mess in the first place. It would mark a big moment for the EU too. Its first major defeat. But it has limited powers; it cannot make an unwilling partner reform itself. And old Europhiles like me must wake up and acknowledge the truth behind that. Our dream cannot be fulfilled. The EU is a confederation, not a federal state. It cannot bind its members by force of arms, as the United Stares did when some of its members tried to secede over 150 years ago. The question now is whether the EU can survive a Greek exit, or will it be the start of a general process of disintegration. Greece is not the only country to be a cause for concern. The other bailout cases -Spain, Portugal and Ireland – were always more serious about reform and integration, and I do not see these as being of immediate concern. Cyprus, with its cultural ties to Greece, may be different. But the future integration of Hungary, Romania and Bulgaria are far from secure. At least they are not members of the Euro. Greece seems to be the lesson that the EU learns by. After its entry to the Euro, the EU became much stricter about allowing further new members. After its flawed bailout, which let many private sector investors off the hook, it was much stricter with Cyprus. But what is emerging is a different Europe. One where much less solidarity is expected. And one with an Exit door. It is a system of rules and standards that facilitate free trade, environmental cooperation and good governance – but one where it if you fail you are out. Integration is not necessarily in one direction. The union will no longer be ever closer. Into this sad situation the British Prime Minister David Cameron enters with his attempt at British renegotiation, leading to a referendum. This may seem to be the last thing that Europe needs. But Mr Cameron’s negotiating skills are far more advanced than Mr Tsipras’s, and he is showing much more application than hitherto. This cloud offers a silver lining. It may define a looser union, but if the British public votes to stay in it will offer a counter-narrative to the slow disintegration that is happening elsewhere. Such is what is left of my European dream. Should I apologise for supporting the Euro? The this week’s FT Janan Ganesh suggests that those who supported Britain’s entry to the Euro back in the late 1990s and early 2000s should own up to to their error and apologise for it. He feels that the arrogance of that generation of Europhiles is undermining the pro EU case as we face a referendum on membership. Well he won’t have me in mind. I am not a prominent politician; I wasn’t even blogging in those days. But I did have an opinion – and that was that that the country should be part of the Euro – though not at the exchange rate then on offer (about 65p per Euro). Should I hang my head in shame? In fact this also seems to be a rather desperate line of attack by the Eurosceptics, who are at last realising to their horror that they are being out-manoeuvred. They want to discredit the whole pro-Europe cause. In today’s FT , one its other writers, Martin Sandbu, comes out with a robust defence of British entry to the Euro. He suggests that if the UK had been part of the Euro economic disaster would have been averted, because the European approach to fiscal and monetary policy would have been more pragmatically British. I have also heard a that idea suggested by a commentator from within the Euro zone, though I can’t remember who. I’m not entirely convinced. But it at least raises the big question. It is treated as entirely self evident that the Euro is a disaster, and that British membership would have made things worse for the country. But both these are counterfactuals. We don’t know what would have happened if the Euro had never got off the ground, or if Britain had been a member. Let’s consider the first of these. When the Euro was being formed the economies of Italy, Greece and Portugal were in real trouble. Their governments were losing the confidence of the markets; stagflation followed by hyperinflation beckoned. The Euro lifted these economies – before joining the governments were forced to bring fiscal policy under control; after joining interest rates fell dramatically. But these countries failed to deal with deeper seated problems, and eventually the chickens had to come home to roost. Membership of the Euro delayed the denouement rather than caused it. Indeed it gave these countries an opportunity to head off disaster which they failed to take. Contrast this, for example, to Belgium, also considered a bit of a basket case before the Euro, whose economy now prospers, relatively speaking at least. And for each of the other members of the Euro that ran into trouble something similar can be said. Ireland suffered the consequences of a reckless expansion of its financial system not unlike that of Iceland, outside the zone. Iceland’s crash was at least as painful as Ireland’s. Their problems reflect underlying economic weaknesses that governments failed to tackle. The signs were there. Indeed no members inside the zone seem to want to return to life outside it, with the possible exception of Germany (and Finland perhaps). The ambiguity of Germans is understandable. The interesting thing about that country though is that they were the only, or at least the first, country in the zone to understand the implications of membership for economic management. In the early days they realised they were uncompetitive, and embarked on a programme of “real” devaluation. This was a combination of holding pay rates down and economic reforms to improve productivity. The reluctance of other countries to embrace this style of economic management is the main failure of the Euro project. And what of the second counterfactual? What if the UK had joined? Well the first thing to be said is that the country did not do so well out of the zone. The financial crash of 2008 was deeper, and the recovery slower, than the major Eurozone economies. Britain suffered a persistent current account deficit, supported by an unsustainable exchange rate. We were in a not dissimilar space to countries like Spain and Ireland, going through a financial boom offering the illusion of wealth while not enough was being done to fix the fundamentals. It is not so self-evident that things would have been worse inside the zone. Or perhaps not. I would like to think inside the Euro the UK would have been locked into an exchange rate that suited exporting industries (like Germany after its reform/adjustment programme) and not so subject to financial shenanigans. That would have left the economy in a stronger position after the bust. But such an exchange rate was not on offer. 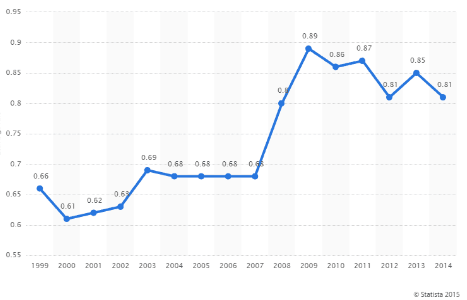 The chart above shows the average exchange rate between the Euro and Sterling for each year of the currency (source: stastica.com). My view is (and was at the time) that the rate of 65p was high (or too low in terms of the graph). It was distorted by excessive government spending and a booming financial sector – there was a substantial current account deficit to show that it was unsustainable. It did not drop to a more realistic level until 2007-2008. That was too late. There was no chance that the government would have followed Germany’s example in conducting reforms to improve the real exchange rate – not while everything was rosy on the surface. So If Britain had joined the Euro at its start or early in its existence, then the exchange rate would have been too high. Which would have made the adjustment period after the crash even more difficult. I’m not going to apologise for this because I understood that at the time (or that’s how I remember it!). But there is a bigger issue that I will have to own up to. The design and operation of the Euro zone was flawed. There are two sustainable ways of running such a common currency area. One is part of an explicitly federal system of government, which allows substantial fiscal transfers between its members and a robust system of federal political control to match. In this system members bail each other out if they get into trouble.To judge from most commentary, you would think that this is the only way to run the zone – and that because the European polity is not ready for such a federal system, then it will never work. But there is an alternative, where each member is not so tied to the others. Each country is left to run its affairs as it sees fit, and if it can’t pay its debts, it goes bust. It requires a sovereign insolvency regime. Nobody bails failing states out. This latter arrangement is what the Germans wanted, and it is what most Britons that supported membership wanted too. But Euro-federalists in Brussels and the southern states saw the currency as a step towards federalism. The Germans didn’t help matters by insisting on system of fiscal rules for members – the “Stability & Growth Pact” – which is only necessary if you are heading for a federal arrangement. The idea that the system was in fact of the federal type was implied by the fact that government bond rates for the different members were almost identical for much of the Euro’s life before the crisis. This was a bad sign – and yet most European leaders though it was a good one. When crisis approached European leaders were complacent. And when things went wrong, there was muddle and confusion. This problem is still not resolved. And here I have to own up. While I saw some of the signs, I did not appreciate the full implications of this ambiguity. I thought it was a problem that could be solved by evolution from within. I still believe that. But the politics of EU membership in Britain are toxic enough as it is. It is better that the country is not part of the tortuous politics of the Eurozone. That is why I accept the consensus that Britain probably never will be be part of the Euro zone. Or not until firstly the zone finds a new and sustainable equilibrium, and secondly that Britain sinks into an economic mire that destroys its self-confidence as an independent nation. Both are possibilities. Meanwhile I am not a fan of an independent Sterling. It has a way of distracting the political elite from dealing with deep-seated economic issues, like our current account deficit, our inefficient underlying economy and our over-dependence on volatile financial flows. But, it has to be admitted, that, with the exception of Germany, the Eurozone members were equally blind to the self-same issues. I apologise for not appreciating that enough. The Conservative leader and British Prime Minister David Cameron’s grasp of the dark political arts is not gone. Last Friday he gave a long-awaited speech setting out his proposals on managing immigration from other EU countries better. It received generally favourable coverage. And, before anybody had a chance to think through what he had said, the story was muscled out by a series of announcements about public spending commitments, in advance of tomorrow’s Autumn Statement by the Chancellor of the Exchequer. If this goes according to plan, Mr Cameron has redefined the political centre ground at a stroke. Will he succeed? In the preceding weeks, not coincidentally while the Conservatives were trying to fight off a by-lection challenge from Ukip, various suggestions had been floated about what the speech might say. The most eye-catching was some sort of quota system for accepting intra-EU migrants. This drew much criticism from other EU leaders. In the event this idea was dropped. Instead Mr Cameron proposed to limit their access to benefits and tax credits, including those for both those in work, and those out of work. Migrants would not be entitled to these benefits unless they had been resident for a full four years. In terms of pure politics this was astute. More moderate commentators were relieved that the quota idea, and its immediate confrontation with other EU leaders, was buried. Limiting access to benefits, on the other hand, sounds a bit like what the opposition Labour Party, and even the Liberal Democrat coalition partners, were suggesting. But the time limit and scope was much greater than anything these parties proposed – pleasing the more hawkish commentators, especially in the right-wing press, who are the main attack-dogs in British politics. Sensibly he left the matter of access to free health services under the NHS untouched. Many older Britons have retired to Spain, where they get access to that country’s health services for free; indeed Britain seems to be exporting oldsters almost as fast as it importing youngsters – something the government will not wish to discourage. And so Mr Cameron will try to present himself as the voice of sweet reason and moderation as the General Election approaches. On the one hand we have the liberals and the left, who are ignoring the British public’s anxieties over immigration. On the other we have the swivel-eyed loons of the Ukip, who demand must more drastic measures, including departure from the EU, which would do severe harm to the country’s economic prospects. Mr Cameron does the faintly plaintive, sweet moderation act pretty well. He praised the contribution of immigrants in his speech, and simply suggested that the country had been having a little too much of a good thing. And the bulk of the British public may well agree. Mr Cameron’s suggestion that we renegotiate our EU treaties and put the result to an in-out referendum sounded similarly sensible and centrist. That the political centre seems to be drifting so far towards muddled populism might alarm liberals like me, but this is reality. But there are problems. The most immediate is whether his own fractious Conservative Party will buy it. Many party workers, and a lot of MPs, actually agree with Ukip about immigration and the EU. Mr Cameron’s policy may sound like a cop out to them. If they start to get vocal, the Tories will look divided, and their credibility will fade. There were mutterings over the weekend, but we will have to wait and see on that. His party did allow Mr Cameron a free hand before the 2010 to define it as more moderate than it really was. If they have any sense they will do so this time. If the British public has any sense they won’t fall for it. The political class are obsessed with the General Election due in May 2015. Any dates after this only matter in terms of manoeuvres designed to secure an advantage at that point. And in that light, divisions within the Tory party are Mr Cameron’s main threat on the issue. It is looking beyond that date that the real un-wisdom of Mr Cameron’s stance starts to emerge. The first point is that it still leaves a problem with the EU renegotiation. While there is some scope to limit access to benefits under current EU treaties (by moving towards a contributory principle), changes of this nature will apparently need treaty changes. Mr Cameron had calculated that the EU would need treaty changes anyway to secure the struggling Eurozone – so adding in a few goodies for his benefit would not be too onerous. But the EU’s leaders are heading in a different direction. With anti-EU populists on the rise across the continent, leaders want to avoid any treaty change, since these are likely to be held hostage to referendum results. Unfortunately voting No to a treaty change has not proved fatal to any EU country so far – it has simply improved negotiating leverage. Going through this process just to save Mr Cameron’s bacon may well be too much. This takes the country a further step towards the EU exit, something that Mr Cameron seems to want to avoid. The second point is that this plan does not actually address any major economic stress point. Access to Britain’s benefit system does not seem to be a major draw for intra-EU migrants – though it may be a stronger incentive for migrants from outside the EU. The British public will not notice a diminution of EU migrant numbers. The policy is designed to address tabloid exaggerations, not reality. The tabloids will simply move on to some other nonsense. All that pain for no real gain. Still practical solutions to the country’s problems count for little in the current political debate. The populist right blame the EU and immigrants for the country’s problems. The left blames some combination of bankers, capitalists, greedy rich people or deluded neoliberals. We may suspect that our problems lie deeper – with demographics, globalisation and the development of technology. We may also suspect that the proffered solutions of left and right will make things worse not better. But no politician, campaign group or tabloid journalist seems to care. That is the real scandal of Britain’s political class. Immigration is now the top issue in British politics, though laughably some nativists still claim that politicians refuse to talk about it. Polls show that it has been one of the biggest issues of public concern for many years – indeed, some suggest that the level of concern is independent of actual levels of immigration. Now that the economy is dropping as a political issue, in spite of Labour’s attempt to stoke up anxiety, immigration is challenged only by the NHS in public concern. But to what extent is the public worry about immigration a fantasy, a displacement of anxiety about other changes in our society, and how much does it reflect real stress? The answer to that matters, or it should. Let us put to one side the Conservative Prime Minister David Cameron’s reason for wanting to limit freedom of movement in the EU: that the British people are his boss. In other words he doesn’t care whether the fear is based on substance, he just listens to what people tell him. We can imagine Winston Churchill in 1940 consulting opinion polls as to whether to sue for peace with Hitler or fight on alone. Leaders should lead, not follow. If the anxiety over immigration is fantasy, our politicians should publicly challenge it; if it is based on real stress, steps should be taken to manage that stress. Unfortunately the quality of debate is very poor. The anti camp are more interested in fanning the flames than examining the real issues, for example by stoking fears that the country will be “swamped”. And yet the migration liberals seem to talk past them and stick to generalities: that migration is generally a good thing in a modern society. And even some who attempt to see both sides, like this article from John Harris in the Guardian, are often unsatisfactory. In spite of the article’s encouraging title “Don’t dismiss public fears about migration as mere bigotry” it turns out that it is largely based on the author’s experience in the East Anglian town of Wisbech, which does little to explain feelings elsewhere in the country. And he swallows at face value Labour’s apology over letting in EU migrants from new members in the early 2000s: this is far from a self-evident policy mistake, even in hindsight. A welcome breath of fresh air is this article from this week’s Economist. This comes from an unmistakably liberal standpoint, but in the best traditions of that newspaper, it is a balanced survey of the evidence – so much better than that paper’s overage of British educational policy. This brings out how much anti-immigration feeling is a sort of displacement of other anxieties, personal and societal, stoked up by the country’s “raucous” press. A telling fact is that anti-immigrant feeling is often highest in communities relatively unaffected by immigration, such as the site of Ukip’s recent landslide by election victory, Clacton. But there are real pressures too. The starkest are in East Anglian and Lincolnshire agricultural communities (like Wisbech). Here unscrupulous gangmasters ship in thousands of workers form abroad to work in the fields for a pittance. They destroy job prospects for the less-skilled locals; crammed into to houses in ordinary residential areas they overload local services and undermine neighbourliness. They are a lawless other, a truly ugly phenomenon, with the workers themselves as much victims as the blighted communities. Then there are northern and midland towns where Pakistani and other Asian communities have not integrated. In Birmingham conservative Muslims have tried to take over state schools to run them on a decidedly illiberal principles. Confused youngsters may be radicalised and converted to terrorist activities. Such British icons as poppy day, to commemorate the sacrifices of the armed forces, may be viewed with hostility. And there are many other such problems: Somali children failing to take to British education; Albanian and Kosovar crime syndicates; rich foreigners buying up London luxury flats; and so on. But what is so striking is how diverse these problems are. Each of the solutions advocated by anti-immigrants would only deal with a small part of the problem. Leave the EU? Well that might help with the EU agricultural workers in East Anglia – but there would also be collateral damage to the farming industry. It wouldn’t help with second and third generation Pakistani residents. A points system for immigrants so that only those with needed skills or money can come in? We already have this for non-EU migrants, and it is far from clear that the collateral damage to businesses and universities is worth any benefits. And it doesn’t help with those London flats. Surely what is needed is not so much these drastic, strategic national solutions, but a number tactical, local solutions – and some international ones too. We need to crack down on the gangmasters and the sort of exploitation that they perpetrate; that does not require EU treaty changes. We need better engagement with and among longer-standing immigrant communities – including better teaching about Islam in our schools. This may mean bypassing the paternalistic “community leaders” in many cases. Serious action is needed to root out prejudice in our police forces. The paternalistic Labour one-party states that predominate in so many of the country’s urban local authorities needs to be replaced by something more pluralist and democratic. And so it goes on. But liberals must also confront two strategic problems: housing and the welfare state. A common complaint is that the number of immigrants is putting pressure on limited housing resources, which is depriving poorer people (of all races, it might be added) of access to decent housing. Immigration is by no means the only reason why housing is under pressure – but there must be some substance to this. An obvious answer is to build more houses – but that will often mean blotting out nice bits of green countryside, especially in urban greenbelts. My personal view is that the rising population is driven by demographics – younger immigrants are being sucked in as older people leave the workforce to retire. As such limiting numbers of immigrants will create worse pressures elsewhere. So we badly need a decent housing strategy. But I also think that a lot of the pressure on green land comes from our dysfunctional private sector developers, exploiting English fantasies of the sort of home they want to make quick profits. In fact dense, urban housing is much more sustainable in the long-term, even if it is expensive in the short term. Also it would be good to revive local economies that are currently weak, for example in many northern cities, and where housing pressure is much lower. But some loss of greenbelt is inevitable. This isn’t easy, but we need to put more of the political class’s creative energies into this, learning from past failures. Welfare is more awkward. Unlike most of our European neighbours, Britain does not operate insurance-based welfare. We run according a more socialist ideal based on need. This is exemplified best by the NHS – but similar thinking runs through the whole system. With an insurance system, even if state-run, it is much easier to control access, and reduce access to recent immigrants. We don’t really know how much our open access to welfare encourages poorer migrants. But it is the poorer migrants that create most of the difficult issues. There may be much mythology in the idea of welfare tourism – but there is also plenty of anecdotal evidence that our welfare system attracts migrants to Britain rather than France, say. Should we start to move towards the insurance model? This is what Labour are suggesting by re-establishing a “contributory principle”. I have to say that I worry about this. It’s a neat way to keep new, unskilled migrants away without burdensome immigration systems – but I suspect there would be a lot of collateral damage to longer-term residents. We have taken our welfare state in that direction for a reason – and it is an attractive idea. There may be other reasons to move towards and insurance model (which, after all was the idea of the original Beveridge system) in times when tax revenues do not flow so freely. I don’t have a view on this – but like housing it needs to be a central area of political discourse. And my conclusion? High levels of immigration are a fact of life for Britain. Crude regulation, or drastic measures like leaving the EU, will create more problems than they solve. But there are some real pressures that our political class should address. And there are many problems, not one. Can the European Parliament address the EU’s democratic deficit? As I have often remarked on this blog, the European Union plays the tortoise in Aesop’s fable to the United States’ hare. The EU’s forward motion is imperceptible and it is easy to make fun of it, compared to the easy strides made by its American counterpart. And yet when reviewed over the long term, progress is dramatic. At the moment we are witnessing an ugly row in the EU about who should be the President of the European Commission. This follows a rather dramatic election to the European Parliament (EP) in which Eurosceptic and populist parties made big advances, not least here in the United Kingdom. But these apparently discouraging could mask a major advance by the parliament. At the centre of this drama is the problem referred to as the EU’s democratic deficit. A large proportion of the member states’ laws (to say nothing of most European non-members likes Switzerland and Norway) are now derived from the EU’s federal institutions. These are led by the Commission. These laws, and the Commission itself, do not seem to be subject to the same standard of democratic challenge and accountability that people have come to expect in a democratic polity. EU laws are presented as impositions from outside from an unaccountable bureaucracy. Two EU institutions are meant to provide democratic legitimacy. Firstly there is the European Council, consisting of the heads of government of all member states. This works mainly by a system of qualified majority voting, so that laws can only be approved with substantial inter-state coalitions. Some areas require unanimity. There are two problems. First, its attention span is necessarily short, so there is a limit to the extent of any detailed scrutiny – though this is improved by delegation to more junior ministerial meetings. A bigger problem is that the public perceive their deliberations to be wheeler-dealing: an unseemly process of stitching voters up. Prime Ministers do not have their voting records at the Council examined in the way that US Senators do, and they easily pass decisions off as not being theirs. The second institution meant to provide democratic legitimacy is, of course, the EP. European federalists see this institution to be the forerunner of an active federal parliament, like the US House of Representatives. So far it has been a disappointment. Elections have drawn a low turnout; there is little awareness among voters about what it does; voting is dominated by national politics. There is no “European polity” that forms the basis of its legitimacy, where there plainly is an American one for the House of Representatives. European federalists have sought to address this problem by making the EP matter more. First it was given greater legislative power; its importance has risen to such an extent that its members are now subject to extensive lobbying by commercial and other interest groups – but the public has barely noticed. Who cares about the finer points of intellectual property or bank regulation, after all? Their next idea was to give it a bigger say in the selection of the President of the Commission – the nearest thing the EU has to a Prime Minister. Their idea was that each of the transnational political groups into which MEPs are organised would select a leading candidate, referred to by the German word Spitzenkandidat. The Spitzenkandidat of the largest party would be nominated to be President. This is the way Germany picks its Chancellor, and also the way Britain picks its Prime Minister. The winner of this process turned out to be Jean-Claude Juncker, the former Prime Minister of Luxembourg. Here in Britain this process has been observed with a mixture of contempt and disdain by the political elite. It is nonsense to suggest that voters were picking one the Spitzenkandidaten when they were voting, they say. Mr Juncker’s nomination has no democratic foundation. And besides we don’t like him. One British journalist claims that this is no better a way of running the Commission, than monetary union was for running Europe’s economy, following the British elite’s view that the Euro has been a disaster (gently skating over their own country’s own troubles outside the Euro zone). David Cameron has led the charge to dismiss this process and pick somebody else, who would be more “reform-minded”. He has at least tacit support from other party leaders here, and in a few other EU countries. But this stand is looking increasingly costly, expending Mr Cameron’s diminishing stock of political capital within the EU. He has been out-manoeuvred, and it is likely that Mr Juncker will get the job. Much of the criticism emerging from British commentators is true. Mr Juncker does not inspire confidence as the man to take the EU forward to something that will function better. The EP does not represent the will of a European polity. The battle of the Spitzenkandidaten never took off in the election debates. But they have missed two important points. The first is that this years’ EP elections were a major political event, right across the union. Turnout remained low, but it was actually up on the previous election in 2009. The combination of it being seen as an election whose consequences are relatively weightless, and the use of proportional representation, have made the outcome unpredictable and dramatic. The rise of populist political parties has enlivened the election, and have given electors a voice that they would have been otherwise denied. This invites a crisis of confidence in the EU, but, paradoxically, it gives the EP a greater degree of legitimacy. The election results in the UK were described as a political earthquake. No longer are the elections a sleep-inducing irrelevance, but they have become an important test of the political temperature. Some of the consequences are ugly; mainstream politicians are pandering to the populists, allowing racism to make a comeback. But it puts the EP on the political map. The second point that British critics miss is that the argument over Spitzenkandidaten is not about the present; it is about the future. The current candidate may have no democratic legitimacy, but in order for future ones acquire that legitimacy it is necessary for us to behave as if they did. This is not about the election in 2014, but the one in 2019. The tortoise beats the hare because he focuses relentlessly on the ultimate goal, while the hare is distracted by the issues of the moment. Should we applaud this turn of events? The EP has taken a great step forward. There may be no sign of a European polity yet, but each of the national delegations has greater democratic legitimacy with their own national polities. That is a clear step along the path. Does the EP provide the answer to Europe’s democratic deficit? Or should it be abolished? Abolition is not an option for now. And the EP may provide part of the answer. But we should remember one thing. In order to judge the success of the EU and its institutions we must look over the long term. While currency union has endured almost unbearable stress, it is much too early to write it off as a failure. As the EU stumbles forward into unmapped ground, the same must be said for the European Parliament.